When you mention tricks created by Jerry Andrus, several classics of magic come to mind: his Linking Safety Pins, Andrus Card Control, his classic coin routine, Miser's Miracle are but three. None are more famous, amazing, or popular as his Zone Zero. This routine is totally unique, not difficult to perform, and can be adapted to many situations and themes. Show a board (11" x 17" styrene plastic with original Jerry Andrus design on both sides). There is a hole near the center. The board is shown on both sides. and both hands are shown empty. 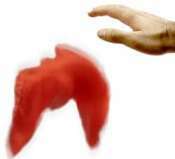 The performer reaches through the hole in the board with an empty hand and comes out with a brightly-colored (2.5") rubber ball. The ball is bounced on the floor to show it is an actual, solid ball. The ball is put back through the hole (and back into "Zone Zero"). Immediately the board is shown on both sides and both hands are repeatedly shown empty in the process...the ball is gone! The magician explains that the ball does not exist when it is in "Zone Zero." He reaches through the hole and brings the ball back out. "The ball exists when it's out here...but not when I put it through the hole and into Zone Zero." The ball is put through the hole and again it completely vanishes. The board is shown on both sides and the hands are empty. Includes: 11 x 17 silk screened "Zone Zero" board with original Jerry Andrus design, 3" ball, DVD with instructions and additional rare footage of Jerry Andrus, plus written instructions that include the Perfect Page routine. 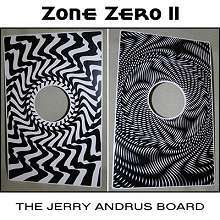 The Zone Zero Board Design on this board is the same as on the original board used by it's inventor, Jerry Andrus. Side one, on the left above, is a picture of Jerry's pulse. Jerry created this design by placing photographic paper on a turning drum. He then affixed a small mirror on his arm, so it moved with his pulse. In a dark room, he shined a light on the mirror so the reflected light hit the photographic paper on the turning drum. The result was a single, squiggly line created by his pulse. 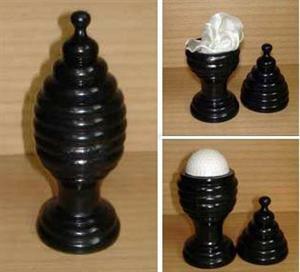 He then duplicated the design, in a spiral fashion, to create the design on the left. This design also appears on the cover of Andrus Card Control.